More Than 10 Million People Got Insurance Because Of Obamacare, Feds Say The number of Americans without health insurance declined by 10.3 million because of Obamacare enrollment, according to a report from the Department of Health and Human Services and the Harvard School of Public Health, published in The New England Journal of Medicine on Wednesday. That represents a reduction in the uninsured rate for adults aged 18 to 64 from 21 percent last September to 16.3 percent this April, the HHS analysis concludes. It appears by the second graph that there's been no change from the historical trend. 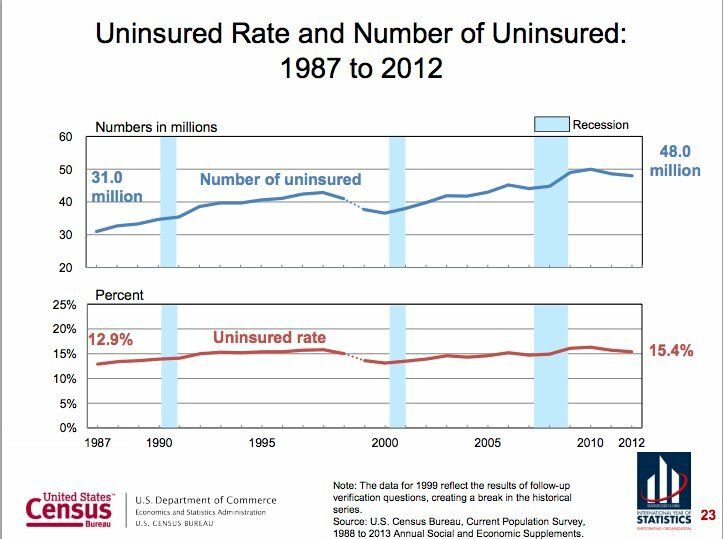 Have "More Than 10 Million People Got Insurance Because Of Obamacare"? The source they list is a recent report from the New England Journal of Medicine. The 10.3M number is given there, but there are a few other factors to consider. This doesn't clearly say what time period/method they use to get the "baseline trend", so it's hard to give a precise figure, but it's clear that they're adjusting for some sort of previous trend. The pattern of coverage gains was consistent with the effects of the ACA, with major gains for persons likely to be eligible for expanded Medicaid on the basis of their income and state of residence but smaller and nonsignificant changes for low-income adults in states without Medicaid expansion. Absolute gains were largest among young adults and Hispanics, two groups with high uninsured rates at baseline. State-level estimates of coverage gains were significantly associated with official HHS enrollment statistics, showing that each percentage point of the state population enrolling via the marketplaces was associated with a half-point decline in the uninsured rate. Nonetheless, the inherent lack of a control group precludes a causal interpretation for these findings, and other unmeasured factors may have contributed to these changes. In summary, it looks like HuffPo did what most journalists do: Take a single number/soundbite from a paper and report it. There are confounding factors, and the number quoted is jut an estimate, but it's clear they have taken a lot into consideration. It's not just a WAG. How many people have lost their health insurance as a result of the ACA (Obamacare)? Did the Affordable Care Act (Obamacare) increase individual market premiums by an average of 49% nationwide? 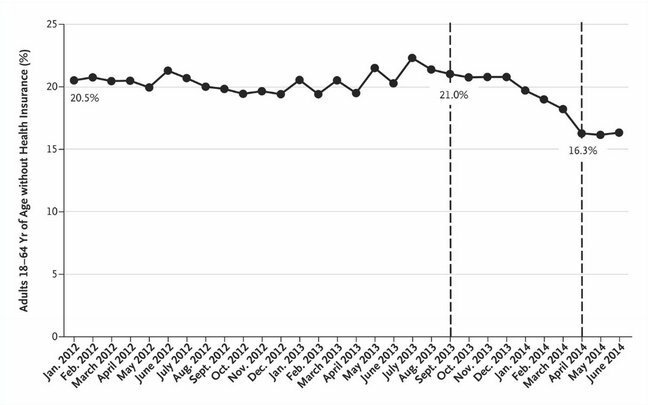 Did 79% of Greeks not have health insurance in 2013?